Spill a glass of red wine or spoonful of cranberry sauce on your favorite shirt? Follow these simple stain removal tips for Thanksgiving to save the day and your clothes. We’ve all been there. You’re enjoying a delicious Thanksgiving dinner with your family and friends when Uncle Bob reaches for his third helping of mashed potatoes and accidentally knocks a full glass of red wine all over your favorite shirt. It may seem like all is lost, but don’t throw away your shirt just yet. Plan ahead. Any big meal with lots of food and guests is bound to cause a spill or two. 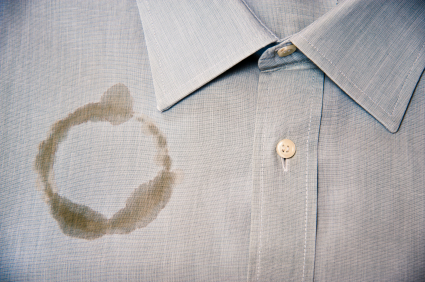 Keep a stain remover on hand for the event. Move fast. Fresh stains are much easier to remove than stains that have been allowed to dry. Act quickly for greater success. Read the directions. Every stain removal product has its own set of instructions. Follow the directions for the best results. Test a hidden area. Always test a stain removal product on a hidden seam or other unseen area. If it changes the color, don’t use it. Apply to the back of the stain. When applying a stain remover, it is a best-practice to apply it to the back of the stain for optimal results. Wash and repeat. Be sure to thoroughly wash the item after treating a stain. If the stain is still there after the wash, reapply the stain remover. Don’t stress out. Unfortunately, some stains will not come out without damaging the item. Just follow the directions and know you did your best. We hope you have found these clothing stain removal tips for Thanksgiving Day helpful. For more stain removal advice, visit one of our many laundromats in New Jersey and – from everyone at NJ Laundromats – have a Happy Thanksgiving!